Gum disease or periodontal disease is the main cause of tooth loss in adults. The early signs and symptoms of gum disease are often unnoticeable and as many as 50% of adults have the disease. Gum disease occurs when the small pockets around the gum margins of natural teeth become overpopulated with harmful bacteria. These bacteria together with mucous form a colourless sticky substance called plaque. Over time if this plaque is not removed it will harden and form tartar. The aim of tooth brushing is to remove the buildup of plaque. The bacteria within plaque and tartar start to spread below the gum line. The waste excreted by the harmful bacteria causes infection and inflammation of the gum tissues. The tissues become red, swollen and swollen because of these bacteria. 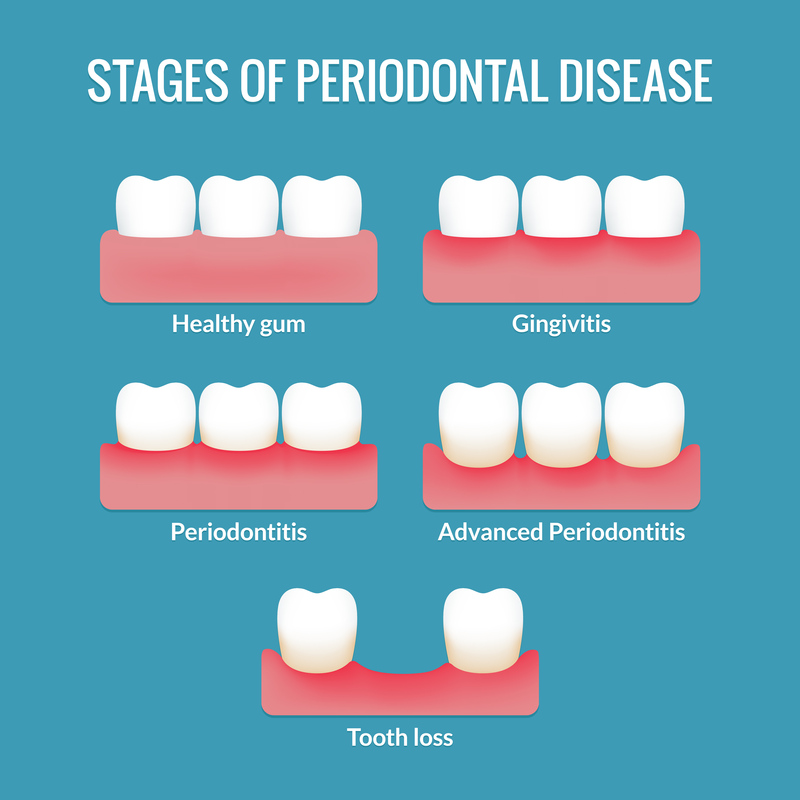 This early stage of periodontal disease is known as gingivitis. Gum tissues tend to bleed easily during the gingivitis stage as the body increases the blood flow to these areas of inflammation. The increased blood flow allows an increase of infection combating cells to reduce the infection of these harmful bacteria. Gingivitis can be reversed with good oral hygiene, brushing, flossing and or using interdental brushes/sticks. Regular hygiene appointments with your dentist or hygienist will reduce the amount of plaque and tartar buildup. When gingivitis is not treated it will advance into periodontal disease. 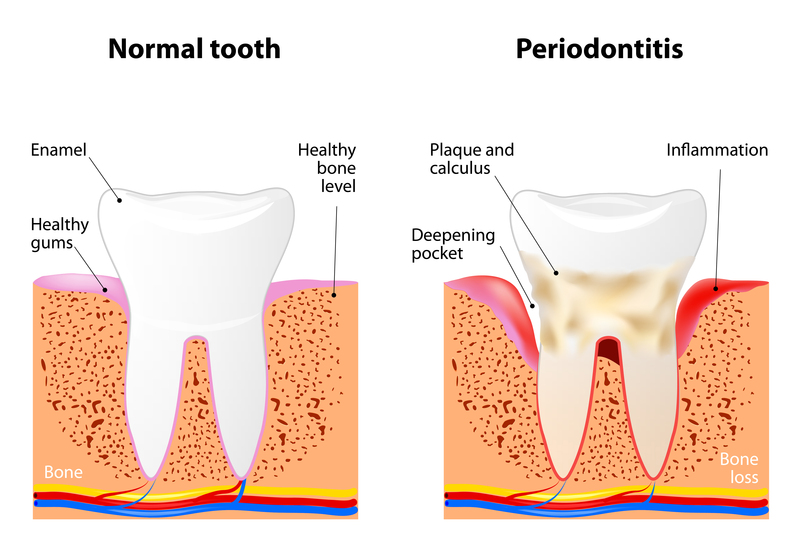 In periodontal disease the gum tissues start to pull away from the tooth surface and deeper periodontal pockets develop as the bacteria inhabit deeper areas around the tooth. The deeper pockets become more difficult to clean and treat and in turn causes the disease process to advance further. Smoking is a risk factor for gum disease. The contents within tobacco smoke cause a reduction in blood flow in our mouths. This reduced blood flow can hide the bleeding symptoms of gum disease. Overcrowded teeth reduces the effectiveness of toothbrushing hence makes those teeth and gums more susceptible to periodontal disease. 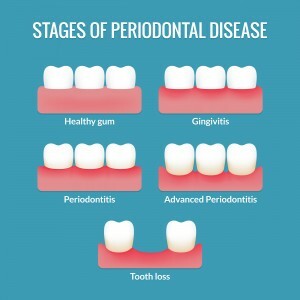 As the periodontal diseases progresses the waste excreted from the bacteria starts to destroy the bone and connective tissues that surround and support our natural teeth. If untreated the damage will eventually lead to extensive bone loss and make teeth unstable. The lack of bone support can cause teeth to move forward and become mobile and eventually lead to loss of teeth. 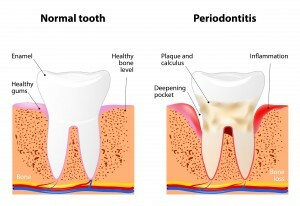 What are the risk factors in developing periodontal disease. Smoking, is one of the main risk factors of gum disease. Tobacco smoking causes reduced blood flow in gum tisssues that leads to reduce response from the body to combat infection. The reduced blood flow can also make diagnosis of periodontal disease more difficult as there is little or no bleeding. Heavy smokes may not reaslise that they have gingivitis or periodontal disease in the absence of bleeding gums. Medications. Some medicines reduce the saliva flow in our mouths and cause a dry mouth. Saliva has a protective effect on our mouths. Some medications used in epilepsy and blood pressure can also cause overgrowh of gum tissues. This overgrowth leads to more difficult areas to clean and facilitates bacterial overgrowth and plaque accumulation. Systemic diseases like diabetes, autoimmune diseases AIDS or cancer therapies can have a profound impact the health of gum tissues. Genetic factor. It is very well known that if your parents were susceptible to gum disease then you are at a higher risk of developing gum disease. This is particularly noticeable in the more aggressive forms of periodontal disease. Crowded teeth makes cleaning more difficult. The aim of toothbrushing is to reduce the accumulation of plaque so overcrowded teeth are more likely to have small areas that are inaccessible to brushing and dental floss. Your dentist and hygienist should carry out regular periodontal disease screening during your regular examinations. The gums are checked for bleeding and the results of this are recorded in what is called a bleeding index score. Bitewing radiographs are used to assess if any bone loss has occurred. A periodontal probe is used to measure the depths of the periodontal pocket depths. The individual depth scores are recorded and used to form a basis for treatment. Shallow probing depths would not require treatment and simple oral hygiene instructions are reinforced. However in deeper pocket depths periodontal treatment may be required. Treatment may involve all of the following, oral hygiene instructions, tooth brushing technique, flossing technique instruction, scale and polish, root planing and antibiotics. The dentist will reduce areas of plaque retention like overcrowding, poorly fitting crowns, poorly contoured fillings and remaking of dentures that cover too much of the gum surfaces. The hygienist or dentist will scrape off tartar that has accumulated along the gum margins. Ultrasonic or Piezo scaling units tend to be more effective, faster and more comfortable for patients when compared to manual scaling alone using hand scalers. Usually your hygienist will use a combination of ultrasonic and hand scaling to remove tartar buildup. Local anaesthetic may be required to reduce any discomfort while the treatment is being carried out. When is periodontal surgery required. Your periodontist may recommend periodontal surgery if the periodontal disease has not responded favourably after deep cleaning. 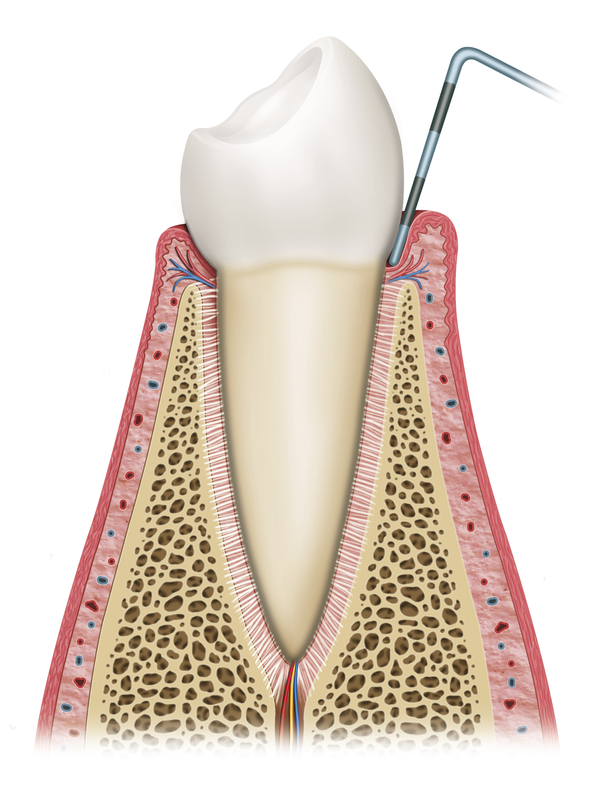 The aim of surgery is to reduce the depth of the periodontal pocket to facilitate cleaning. The periodontist will create a flap and expose the affected tooth/root surface to be cleaned thoroughly. The flap is then repositioned in a way so that the tissues fit snugly around the tooth surface. In some case bone grafting may be recommended to regain bone that has been lost around natural tooth roots. Brush your teeth after meals, use a soft tooth brush and fluoride toothpaste, ensure that you clean all tooth surfaces properly using small round circular motion. As a general rule 2 minutes of brushin is usually recommended. See your dentist or hygienist regularly for hygiene appointments. It has been shown that patients who suffered from gum disease were at a higher risk of developing heart disease when compared to patients that did not suffer from gum disease. If you are concerned about the possibility of having gum disease contact your dentist or hygienist. Brighton Implant Clinic is a group of dental implant clinics based in Sussex that offer affordable dental implant treatment to patients that have lost teeth as a result of trauma, missing teeth from birth or tooth loss as a result of gum disease. Dental implants are small titanium screws that are placed into the jaw bone that can offer an alternative for missing teeth and are generally more comfortable than removable dentures. Unlike removable dentures, dental implants are fixed to the jaw bone. The feel and function like natural teeth. If you are interested in dental implant treatment the clinic provide a FREE dental implant consultation.